I’m not sure why it has taken them two years, but the World Meteorological Organisation have just got round to telling us that 2001-10 was hotter than the previous decade. The average global temperature for 2001-2010 was 14.47 degrees Celsius, according to the report. That’s 0.21 degree warmer than 1991-2000 and 0.79 degree warmer than 1881-1890. Of course, they might have mentioned that the eruption of Pinatubo in 1991 meant that temperatures in that decade were depressed. GISS have estimated that global temperatures were lower by as much as 0.25C for up to 5 years as a result. This means that about half of the 0.21C warming was simply the rebound from Pinatubo, and nothing to do with greenhouse gases. One wonders why they did not mention this fact. Composite global surface temperature change near the time of the five volcanos producing the greatest optical depths since 1880: Krakatau (1883), Santa Maria (1902), Agung (1963), El Chichon (1982) and Pinatubo (1991). A rise of 0.1C per decade is certainly not unprecedented. Indeed, HADCRUT4 numbers show that the 1901-10 average temperature anomaly of –0.439C had increased to –0.022C by 1941-50. So, over four decades, there was a rise of 0.417C, or 0.104C per decade. This is illustrated in Figure 1. In any event, using artificial decades is, well, artificial. If they want to use 10-Year averages, let’s see what a rolling average looks like. The 10-Year running averages have essentially flatlined for the last few years, and have actually started to decline slightly since 2010. For instance, the current 10-Year average for RSS is 0.24C. The period 1997-2006 was 0.25C. In other words, no increase for seven years. Since 2003, the 10-Year average for RSS has gone up from 0.20 to 0.24C, a rate of less than half a degree a century. Meanwhile the World Bank babble on about a “4 degree” increase by 2100. Wherever they get this from, it has no basis in reality. Ed Hawkins, climate scientist at the National Centre of Atmospheric Science of the University of Reading, makes similar comments. The langauge used by WMO is the language of fraudsters and con artists. The lack of precision such as using decades between years that end in a zero is laughable – what possible relationship to the climate mechanisms can such intervals have. Same old, same old. 2011-2020 might well be a rapidly cooling decade and take some shine off their alarmism. However, that would be playing along with their game and frankly I can’t get alarmed about tenths and quarters of a degree C while the quality and virtue of the data remains dubious. Buy long underwear . . . Big cold coming! Question:- See that article head image by The Age about AGW. Why is there an advertisement promoting Hyundai Australia, suppliers of motor cars etc.? Seems odd to me they promote what they don’t want done. Hottest…ever. In all of human history. Since records began. By a fraction of a degree, unmeasurable by instruments. But the assertion remains. Big drama, small difference. Club-of-Romers hard at work. The reason for the late screaming is the period since 2010. The failure of the models. The projected cooling to come. All these things and more has caused a general sense of unprecedented panic and unprecedented exaggerations. …..almost doubling the pace of sea-level increase and causing a 20-fold jump in heat-related deaths, the United Nations said. Man the lifeboats. Turn on the AC power if you can afford the high cost of energy caused by windmills and mirrors. Sheesh! Using decades as intervals is arbitrary and thus meaningless. Why not 11 year periods or 13 year ones? Cherry picking after realizing a propaganda point could be made, nothing more. It’s simple, they’re committing fraud. They know the facts do not support their assertion, so they pick timelines that will make it look like they’re right. Cold here. Have long underwear. Wearing. So according to the UN, for EVERY single person to die from heat in 1900. Twenty people die from heat today. This is a government lie. You have to wonder what sphincter they pulled this twaddle out of. I suppose that they think, like Goebbels, that if they repeat a big enough lie long and loud enough, it will stick. Of course der Fuehrer will be all over this. On heat related deaths, a jump since what date / period? What are the sources for this claim? How were the heat related deaths arrived by? My BS detector is tingling. Why would someone be quoting the World Bank as an authority climate? Strange. Remind me who is lined up to be put in charge of the $100bn UN climate slush fund that will be exempt from any outside audit and beyond the legal authority of any country in the world. Specifically those who are expected to sign up to pay for the slush fund…..
Wasn’t it the World BanK? Purely coincidental no doubt but it does mean they have one mother of dog in the fight. And since their area of expertise is financial rather the climate science we may expect their declarations on the subject to be based whether they get to play with and extra $100bn per year every year than on “the science”. They bring out the report in the first week of JULY. What a coincidence! What’s ‘hot’ about 14.47 degrees C ?? 1) Haven’t they depressed old temps and raised newer ones to even get the 0.7 increase from 1880 to 2000? 2) With no statistically significant warming for 16 years, admitted by UEA’s Jones, Hadley Centre, Hansen, and IPCC, the WMO statement is a cornered rat one. If it stayed this temp until 2020, then they would say that the second decade of the 21st Century is tied for the hottest decade of the Century. This kind of pronouncement is the elitist way of telling us that the vast majority of people are stupid enough to be shocked by this kind of rhetoric. The flat record is the climatological elephant in the room. Its like the Met Office in UK convening a group of hand-picked experts to brainstorm why the UK was having DISAPPOINTING WEATHER, when they mean disappointing forecasts, why isn’t the weather cooperating with theory. 3) When cooling sets in, they will still probably be able to say that the second decade of he new century is the second warmist decade. Oh brother, this snail-paced climate comedy is insufferable. Michael Crichton and George Carlin should get the Nobel Prize for climate science – its about the best science I’ve heard so far on the subject. These are classics. The Australian Warmists are under dire threat as the Labor Government under which they thrived and blossomed is facing the axe. For this reason they are making the most awful squealing noises right now they can smell the butcher’s knife! It is telling they don’t say the “hottest century” or the “hottest millennium”. However, 2001-2010 is the warmest 10-year period in the instrumental record. This is evidence enough of a warmer climate, but NOT of an accelerated warming rate. Only if you think averaging temperature readings from disparate locations gives you anything physically meaningful. Some places have warmed, some have cooled, some have remained relatively the same. A “global temperature” gives the false impression that every point on the globe has warmed. Even if the data were flawless, I’d find it very difficult to be alarmed. “Ever” would imply the entire life of the planet. Long before humans were a gleam in Evolution’s eye. The WMO seems to have slipped into what I will here call The Eternally Growing Teenager Fallacy (c): the last decade of the the teenager’s life they have been at the tallest; therefore they are still growing. We know that teenagers don’t keep on growing (pituitary problems aside – which case, the NBA awaits), but we cannot know what might happen with temperature on the basis of where it has been for the past 10 years. We can make a conjecture about what it might be, and then wait and test it against observations. This is what has effectively happened wiht the model projections from 1990 onwards (1988, if we include Hansen’s models in 1988). All of them predicted the past decade would warm. They have all been falsified by observations. They are inadequate, and clearly do not account for all elements in a complex system Clearly, forcing by carbon dioxide amplified by increased water vapour is an inadequate theory and needs revision. None of this sats that GHGs have no effect – but it’s beginning to look like the well established (logarithmic) effect of carbon dioxide provides a better value for climate sensitivity. Science without the political overlay would be busily trying to understand what else might be involved, but Occam’s Razor would probably favour that simple theory based on the known physics of carbon dioxide doubling. (The science is pretty well settled on that point, after all). Isn’t it the case that of all the data sets (inlcuding UAH), RSS is the only one where you can find a 10-year period that is as warm as the current one, and that you have to be perfectly selective about which 10 years you choose? And that the 10-year period in question (1997 – 2006) overlaps with the last decade, and includes the super-anomaly of 1997/1998 el Nino, which shows the highest spike amongst all the data sets? Half the decade reported to be as warm as the current one includes half the current decade. The decade that is actually prior to the current one was cooler. The planet has been warming for 300 years since the Little Ice Age. When would the warmest decade be? The average temperature here in NE England has risen by 20 Celsius in the last six months and we have nine hours more daylight. It must be AGW! I will cancel tonight’s barbecue, we don’t want any more of that nasty CO2 getting into the atmosphere! I have no idea what the actual stats are but I can imagine a situation where this claim is made because Nauru, Lichtenstein, Andorra, Vatican, Mauritius, Luxembourg and half a dozen Pacific islands all had their warmest decade …. and Russia didn’t. and that you have to be perfectly selective about which 10 years you choose? And that the 10-year period in question (1997 – 2006) overlaps with the last decade, and includes the super-anomaly of 1997/1998 el Nino, which shows the highest spike amongst all the data sets? As with HADCRUT, the 2001-10 decade was hotter, as was 2002-11 using RSS numbers. No 1998 El Ninos there. Remember as well that ,on HADCRUT, 2010 was hotter then 1998. I find it odd that people seem to be so confused by the term “plateau”. While plateaus may have high and low points, these vary to such a degree that it can generally be considered fairly even – or “flat” (see the African plateau; the plateau atop Kilimanjaro; the plateau on the top of a mesa). Another amazing thing about a plateau is that almost every point upon it is higher than points around it! This is why the present temperature plateau contains the warmest years and warmest decades since records began – it could even have the warmest temperature “evah”! That the AGWistas find this a startling discovery is more a question of their mentality than of the real world. Meanwhile Piers Corbyn who almost unfailingly gets long range weather forecasts right. correctly predicted this month’s bizarre weather events. 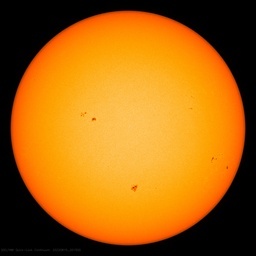 He is a former astrophysicist turned meteorologist, and is adamant that solar activity drives climate. He also beleives we are heading into a very cold period, possibly a mini ice age. I wish Anthony you would invite him to make a guest post. The WMO says that ten years is the minimum time required to detect decadal effects. “A decade is the minimum possible timeframe for meaningful assessments of climate change,” said WMO Secretary-General Michel Jarraud. “WMO’s report shows that global warming was significant from 1971 to 2010 and that the decadal rate of increase between 1991-2000 and 2001-2010 was unprecedented.”…. …‘“A decadal perspective makes it possible to assess trends in the climate system and anticipate the future. The decadal averages are data points. They are comparing one with the other. The average 2001-2010 decadal temperature was 0.21°C warmer than 1991–2000, which in turn was +0.14°C warmer than 1981-1990. It’s ten years to get a meaningful data point, but then you need at least one other data point to compare, which is a minimum of twenty years, and much closer to formal estimates of minimum time neded for analysing climate trends. Overlapping the ten-year period shortens the time frame and is thus less than the minimum requirement, according to the WMO, to compare decadal periods. Regarding ‘unprecedented’ decadal changes, it would be ok then to use any year to start a bidecadal comparison. You don’t have to match the WMO decadal periods, but the ones you choose should be consecutive, not overlapping. Then you’re comparing apples with apples. If temperatures stay flat for another 2 1/2 years, there will be a decadal fall. ( A big “IF”, but the last 12 months suggest that is probable). Is taking 2006 cherry picking? 1997 was probably the first year that the Pinatubo effects disappeared. And of course this fits in with the “no warming for 17 years” argument. Nobody denies temperatures rose during the 1990’s, but it is what is happening now that matters. You obviously failed to understand. As the GWPF explained, nature does not know whether the year ends in a zero. It is a pathetic attempt at cherry picking by the WMO; all they have left. No matter how slow the warming, the last year/decade must necessarily be the warmest since the warming began. Prior to that it was cold. It’s better now. My point was that WMO are calculating consecutive decadal averages. If you prefer to use the latest decade (2013 – 2012) to compare with the previous (1993 – 2012), there is a difference of 0.12C using UK Met Office data. You don’t even have to use Jan – Dec annual averages, but you do have to make them consecutive, not overlapping, otherwise you’re borrowing temperature data from from one decade to calculate another. You can take any data set and calculate ‘the last 10 years’ starting from any year (or month) in the last 20, and discover that the previous 10 years was cooler. You can ‘cherry-pick’ whatever decades you like. Thanks, Paul. Very good article. As HadCRUT has it, the Earth has been cooling since 2001, at near -0.54°C (-1°F) per century. Check it out at WoodForTrees, those who find this fact surprising. WMO are using land-based data (HadCRU and NCDC), which are less noisy than satellite data (RSS). As you need more data to get a statistically significant trend in satellite data, I would imagine that WMO would postulate that 10 years would be a little too short for “meaningful assessments of climate change,” using MSU data. RSS has the largest spike of all data sets for the 1998/97 el Nino, for example. Decadal average comparisons would be impacted by the higher amplitude of ENSO events in the MSU record. Their report is also comparing indices of weather extremes, so it makes sense that they are dealing with bconsecutive ten year averages. A rise of 0.1C per decade is certainly not unprecedented. Indeed, HADCRUT4 numbers show that the 1901-10 average temperature anomaly of –0.439C had increased to –0.022C by 1941-50. So, over four decades, there was a rise of 0.417C, or 0.104C per decade. The rise from 1991/2000 to 2001/2010 is 0.2C. Did you make a mistake here, or are you looking at things differently? The uncertainty of the trend is 6 times greater than the trend itself, so your result has no statistical significance. You cannot say anything meaningful about climate trends from such a short time period. WMO are comparing decadal averages. They are using at least 20 years of data to talk about climate changes. If you run a linear regression for the last 20 years (1993 – 2012), you get a statistically significant trend. Out of interest, I checked the other surface records (GISS, NCDC, HadCRUT4). Looks like you chanced upon the data set with the lowest trend for the period you nominated. None of them are statistically significant, of course, so any comparison is virtually meaningless.